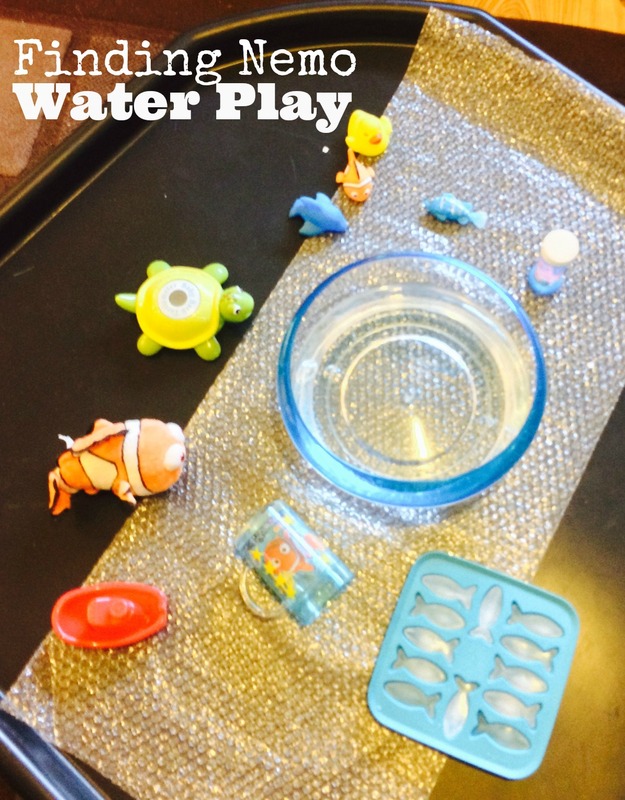 We gathered together some water play toys; Finding Nemo characters along with other fish and underwater characters, boats, bubbles, Finding Nemo cup for pouring, and fish shaped ice cubes which I had made earlier. 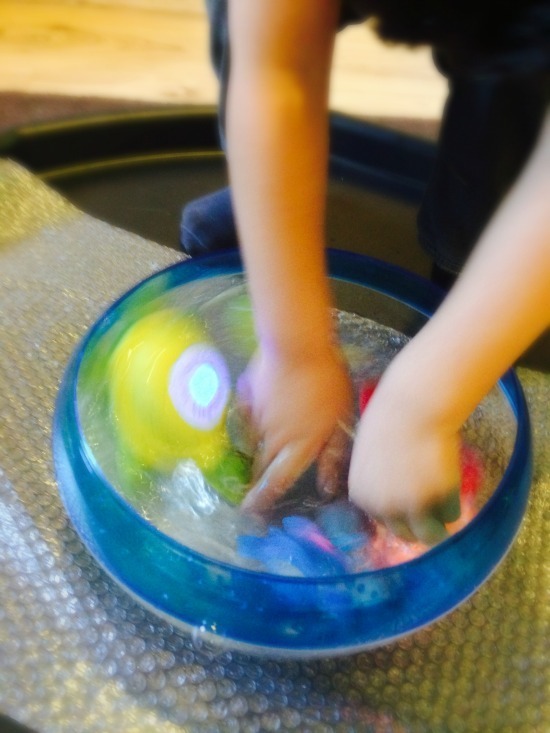 We did the whole activity on top of our cement mixing tray/tuff spot to contain any water spills, and I put bubble wrap on the bottom of the tuff spot just to give a more bubbly feel and another interesting texture for the kids. 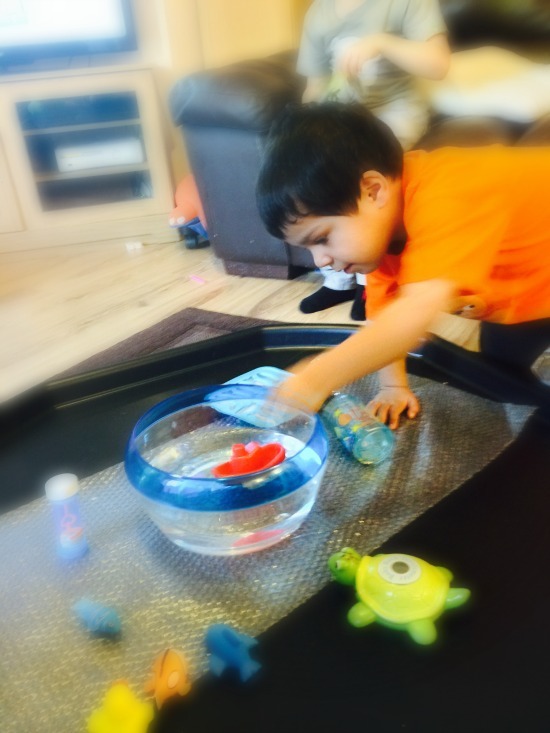 We experimented with putting the ice fishes into the water and seeing how quickly they melted, and with floating the toys on the water. 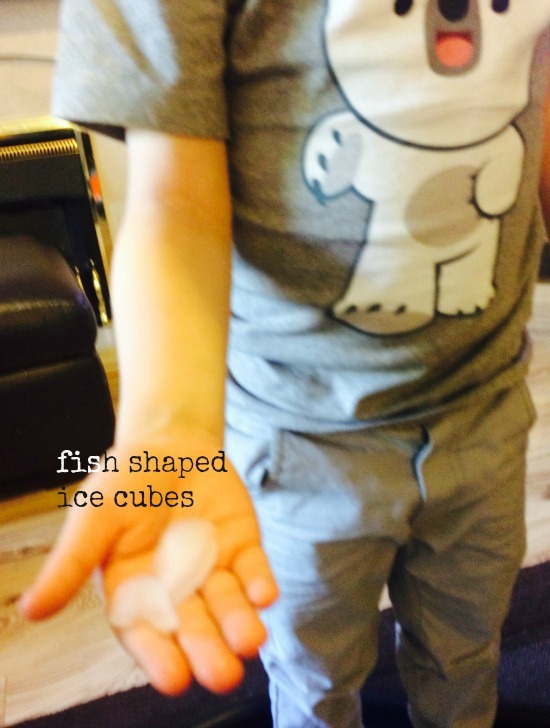 We felt the cold slippery ice on our hands, and thought about whether the ice fishes melted more quickly in our hands or in the water and why that would be. 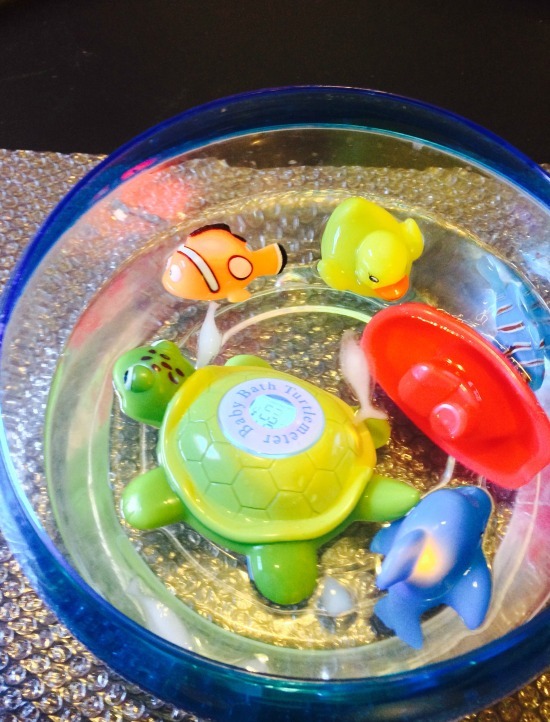 Nemo and many of his little friends light up in the water which the kids love to watch. Nemo’s turtle friend is a thermometer which we used to see how the temperature was changing when more ice fish were added to the water! You can see them in the picture above, even when the water was cold they still melted quickly. Mr T especially loves water, so he enjoyed mixing it all around with his hands. 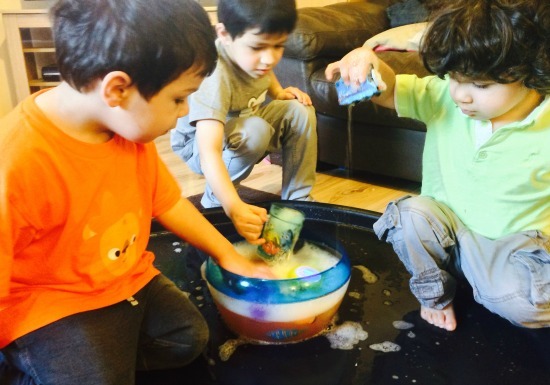 Once they had finished just playing with the water and the animals and had melted all the ice, we decided to make the activity a bit more messy! 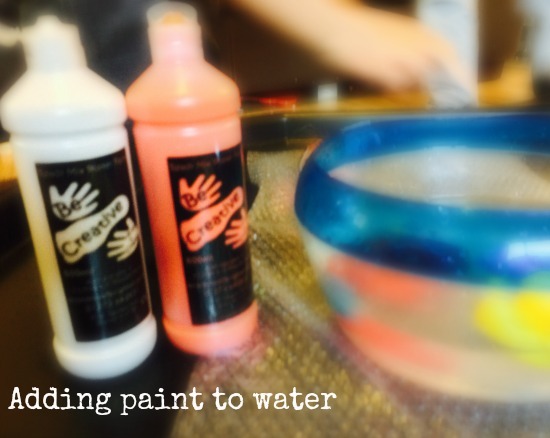 Mr Z really enjoyed squeezing the paint into the water and seeing how it all mixed. He did manage to create a very orange shade which matched with Nemo perfectly! 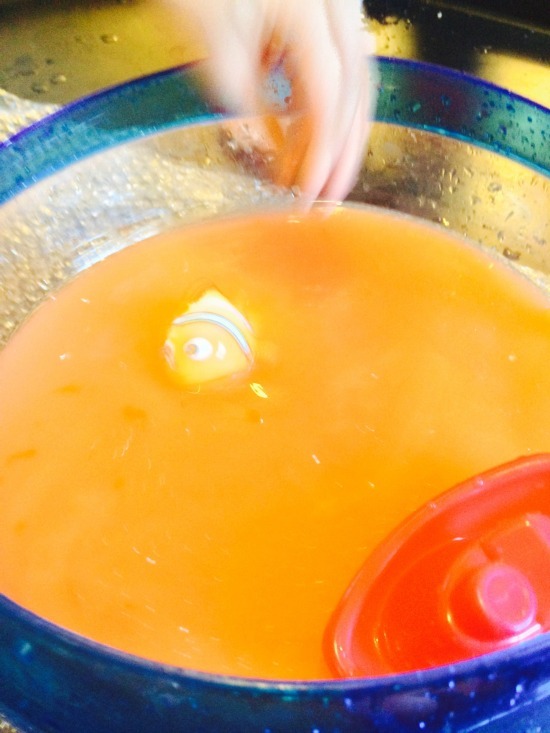 The boys loaded this water into the ice cube moulds so that next time their icy fish will actually be orange like Nemo! 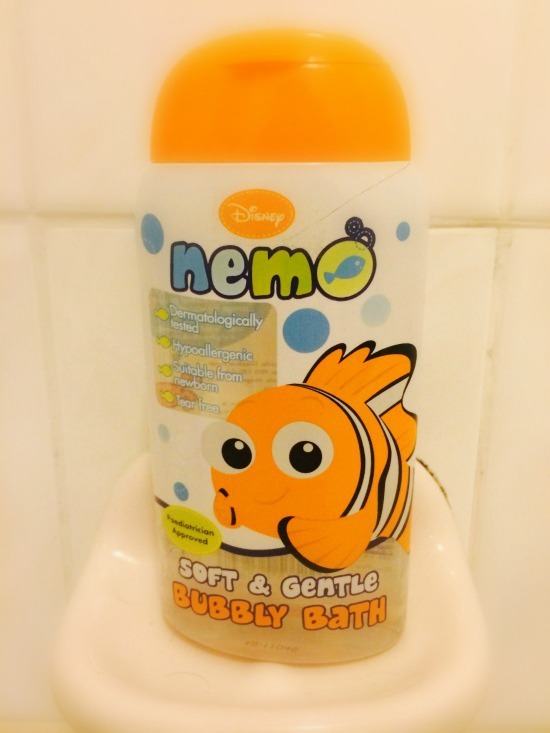 We let them have a bit of the H&A Finding Nemo bubble bath. 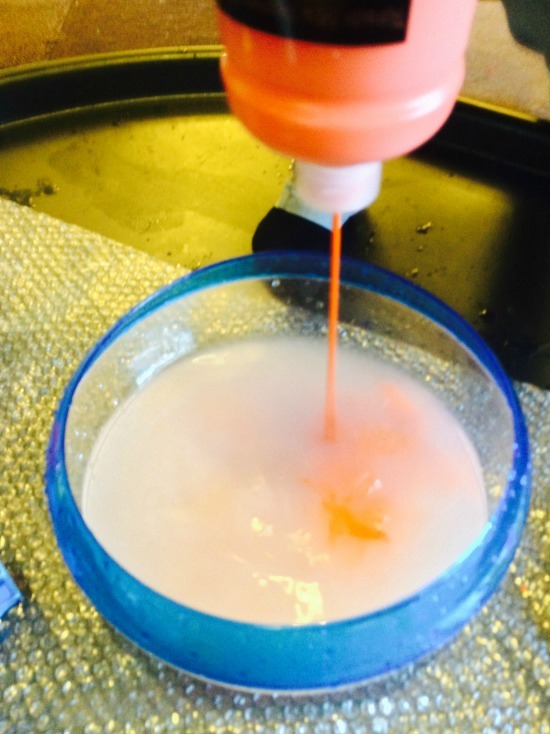 Only a little bit is needed to make plenty of bubbles. Washing all the characters was just as much fun as getting them all messy! All three of them enjoyed the activity together. 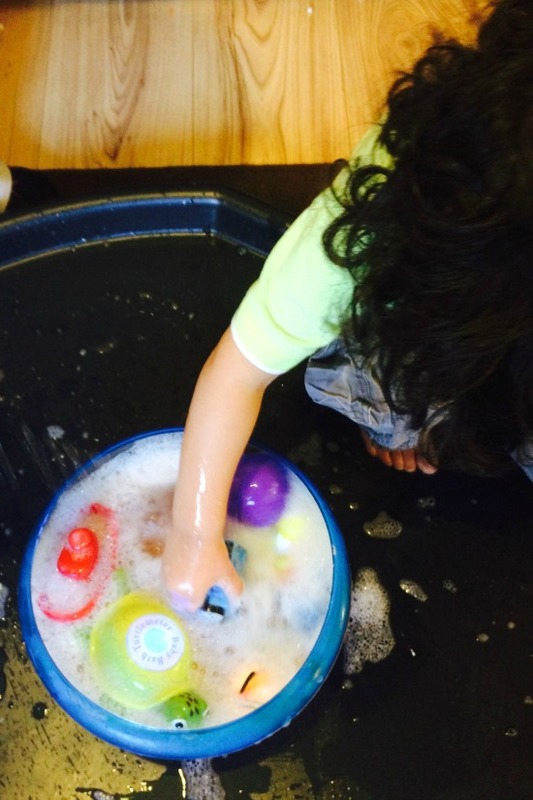 Of course with this type of activity, it inevitably does end up in wet and messy children too. I even had Mr R deciding to paddle in some of the water which had been spilt onto the tuff spot. So after Nemo’s bath, it was time for the boys to all go and have a bath too! 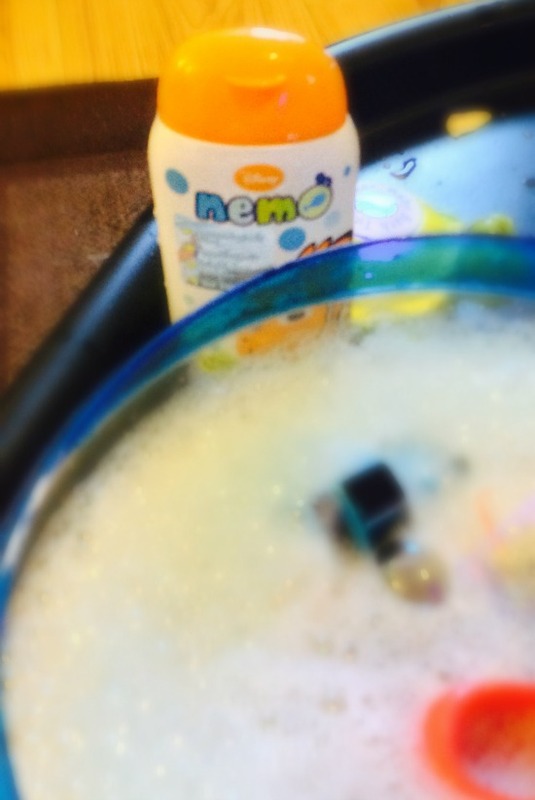 The boys have all been using the H&A Finding Nemo soft & gentle bubbly bath throughout the week and I’ve been very happy with the product. We have tried H&A bath products before (see our Jake & the Neverland Pirates Bath & Shower gel review here) and always found them great. The kids are all at an age where they are very motivated by character products so they love seeing their favourite characters at bath time and it adds an extra bit of fun for them. The soft & gentle bubbly bath is very soft and gentle as the name suggests and I have no concerns about how it will effect their skin. They are not particularly sensitive anyway but the bubble bath is all dermatologically tested, hypoallergenic and paediatrician approved – which would be really reassuring to know if I was using it on them when they were slightly younger, or for a child with sensitive skin. The bubble bath doesn’t have an overwhelming strong smell but it does smell clean and leaves them smelling and feeling nice and fresh. 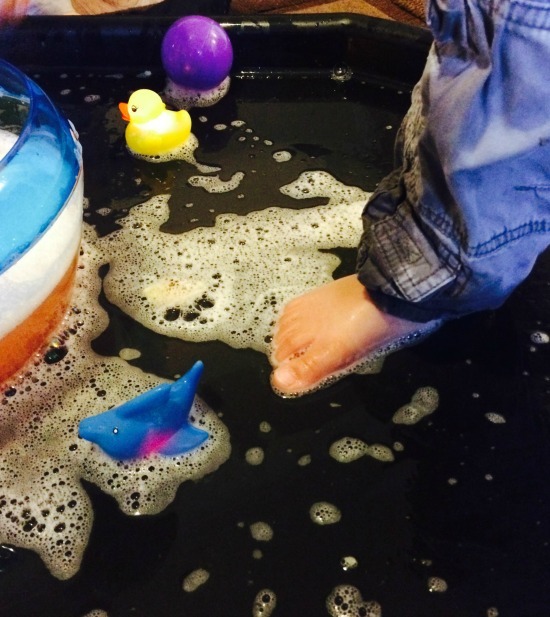 This post is part of a competition to become a member of the H&A Bathtime Fun Squad with Tots100. Click the link to see other entries and find out more. And fish ice-cubes were a great idea! I really need to get a tuff spot, they look like they make playtime lots of fun. Looks like you all had lots of fun. You are so very good to let them play with water in the lounge like that! They looked like they had a ball!! 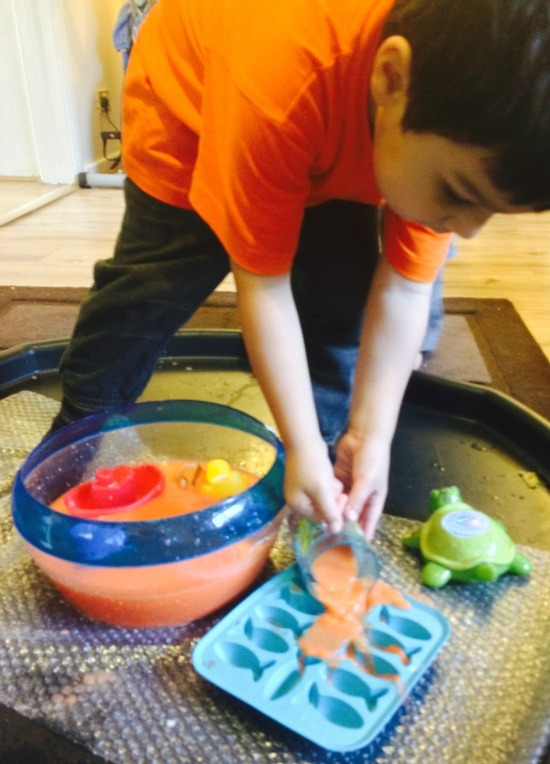 What great sensory exploration and it is always good to get them involved in something that they are interested in. Glad you are happy with your bubble bath too. What fabulous fun they had! fish ice cubes is a great idea, I would have never thought of that. I love playing with water – but you guys took this to the next level. What a fantastic water adventure – and a clean up at the end! Perfect! What a lot of fun! 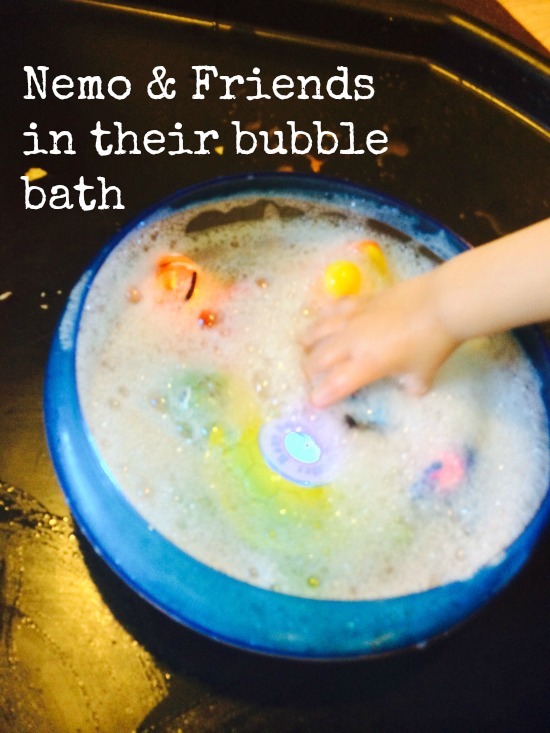 Nothing like getting nice and messy to give the bubble bath a proper testing! The Reading Residence recently posted…Should Children ‘Play’ When Out And About? How wonderful! Looks like great fun. Looks like lots of fun! Thank you so much for sharing with us on FB! Although so hard to choose this week, I’ve added three of my favorite shares to the bottom of this week’s playful preschool post on Exploring Simple Science with TRAINS!!! Hopping over from the Thoughtful Spot Blog Hop! I love how many activities you wrapped in to the movie theme. Great idea! Shannen recently posted…Think You Can’t Homeschool? This Letter’s For You. There are so many lovely ideas here, and the boys are having so much fun! It looks like the Tuff Spot is getting a lot of use too! What great fun and plenty of ideas there, thank you. Our tuff spot arrived last week so we shall give this a go.